Dyeing techniques and discussion. Both modern and period dyes. NOTE: See also the files: green-art, mordants-msg, washing-msg, woad-msg. My lady wife, aoibhinn ni luan, recommends "A Weaver's Garden,"
by Rita Buchanan (1987, Interweave Press, ISBN 0-934026-28-9). that diverse, bright colors can be obtained from period dyes. the history of the plants and their uses. and making your own garden. for those who are interested in chemistry. example of modern misunderstanding of period technologies. 13th C., and was an imported luxury until that time. necessary to be able to make the best greens. I would happily be corrected by someone who knew better. >colors and numbering scheme, and you can find DMC floss all over the place. >fighting tabards. Wouldn't it be nice if they all looked the same? really outside the scope of the recreation. La Trobe Uni, Bundoora 3083. VIC, AUSTRALIA "Well here we all are then." woad, and it will make it fit for use in twenty-four hours." "Receipt to dye 8 lbs. of Deep Blue in Linen or Cotton. alum: mix it all together with 5 gallons of soft water...."
>necessary to be able to make the best greens. "To dye Cotton Yarn a Deep Blue. hickory bark in the liquor and it will produce it." a yellow, or vice versa. All quotations are taken from "The Arcana of Arts and Sciences", by M.
the U.S. so some of the plants may not exist in Europe. > kingdom's regalia? There are several sets of surcoats/cloaks/etc. > because a hideous shade of green was used in their construction. would have loved yarn and cloth of consistent colour. > be instantly identifiable to anyone glancing around as "part of my unit". tell a friend, even if he had changed to a new tabard. "official" items; be it paint, dyed textile or others. We shouldn't make it a law, though. > weavers traded formulae and hanks of threads as samples? they certainly did appear during the Middle Ages. Herr Peder Klingrode greets all Gentle of the Rialto: Frid vare med Eder! > century would have placed much importance on the exact shade. > before the Roman times. And it was used in Scandinavia, too, in the 10th C.
strange shades when dying with indigo. coloured with indigo is more beautiful than naturally dyed green. > Herr Peder, do you have more evidence to support your statement? reference if I find one). I, too, would happily be corrected by someone who knew better. > Europe until the 13th C.
I don't really believe you. But then again, I may be wrong. Could you explain why this was so? from plants native to Britain and Europe fixed with various mineral salts. many shades, and duplicate them, then the dyers of Europe surely did the same. > > of DMC embroidery floss. > > reason, in period! > they certainly did appear during the Middle Ages. has been mentioned for green would make a close much very difficult. will fade in the sun, leach in the washing and bleed into the adjacent cloth. unlikely that cloth from different sources will behave in the same way. originated in the same way. >> be instantly identifiable to anyone glancing around as "part of my unit". >tell a friend, even if he had changed to a new tabard. are rejected simply because they aren't clearly recognizable at a distance. "Per pale blue and light blue, in base an erupting volcano brown." >> weavers traded formulae and hanks of threads as samples? my uncle's employer preferred his competitors to see. through my developing said color. thread - different spools of the "same" color are not necessarily identical. perfect consistency from dye-lot to dye-lot. to be true until the 16th century. even modern technology doesn't always duplicate perfectly from batch to batch. > > Europe until the 13th C.
> I don't really believe you. But then again, I may be wrong. > Could you explain why this was so? with the best blue on top, but the grey washings at the bottom. green is not period for clothes. by Beatrice d'Este and her sister Isabella list some green dresses. were satisfactory for long exposure to light, and others were not." (Liles, p.
(Translation of the first edition of 1548 by Edelstein and Borghetty). ROYAL purple is made from murex. There are lots of other ways to get "sad"
purples and various lavenders from natural dyes. too shallow for my purposes. again, I will attempt it again. Next year I'll save up urine in advance. at just enough to cover their costs. They're also just real nice folks. >is also interested in it. but could never (unless I won the lottery) put together for myself. colors each dye could be expected to achieve with various fabrics. > CJA> colors each dye could be expected to achieve with various fabrics. resulted from various ancient and medieval dies such as Murex and kermes. style stuff like candelabras and silk brocades btw. but every so often there is a great article for SCA types. ilaine at panix.com | of strip-nine-man's-morris. Sheep are stupid, you'll win." such calling for things for philosophical rather than empirical reasons. and interesting article in the latest issue of Spin-Off (which came yesterday). tulip tree leaves, 2 ounces of wool, and a precise list of instructions. ilaine at panix.com | is blue, you are not." Unto Stephen Bloch does Pagan le Chaunster send Greetings! > rich colour will be obtained. > weld (? ), alum, and white tartar. 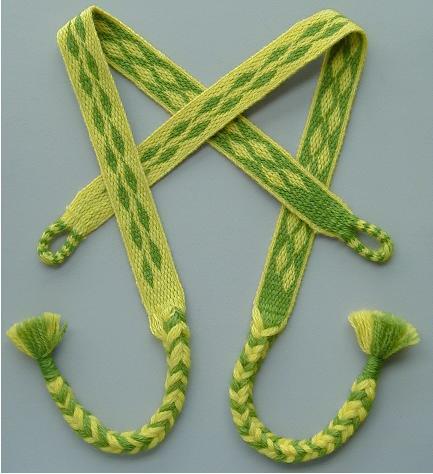 Weld is a plant which gives one of the clearest and most lasting yellow dyes. they were dyed with a mixure of woad, indigo, madder, bran, and slaked lime. alkalinity in urine vats is of the most gentle sort. use in something else -- I've had no trouble getting bran to ferment so far. :-) Thanks for the comments. days together in wine that the colour may be deeper and more durable." Does anyone have any suggestions as to where I might find "Camden's Britannia"? satisfy local 'truth in advertizing' requirements. >lichens would also be available. >You can email Dame Enid care of me, BTW. Designs -- if you'd like the reference, please let me know. So, pretty much all the colors are available in the 9th century. Walton, Penelope, "Dyes of the Viking Age: A Summary of Recent Work,"
in _Dyes in History and Archaeology_ 7, 1988. > >lichens would also be available. my experience boiling tends to produce yellows (at least in New Zealand). Yellow is the easiest and most common colour from natural dyeing. Oh well. > who had dyed themselves blue with woad. produced from woad, but blue's the most difficult. Who knows? > Dyes also existed for green and red. dye them with yellow and then overdye with woad-blue. > Mixing these could produce a wide variety of colors. 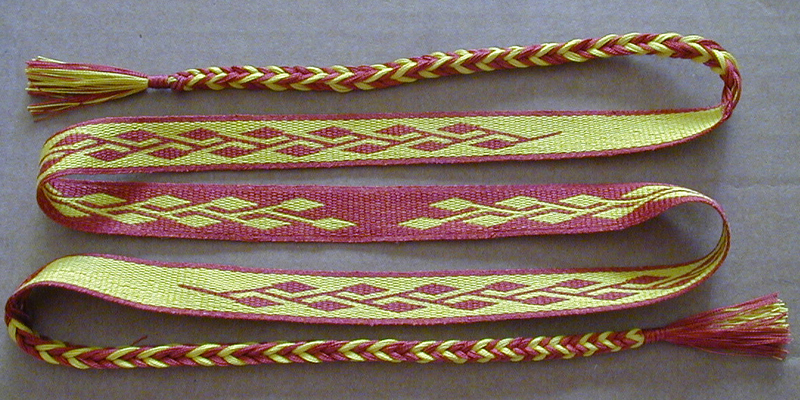 active components of these three dyes were found in textiles from Sutton Hoo. With these primaries you can overdye to make orange, green, and purple. > hence, was expensive and rare. 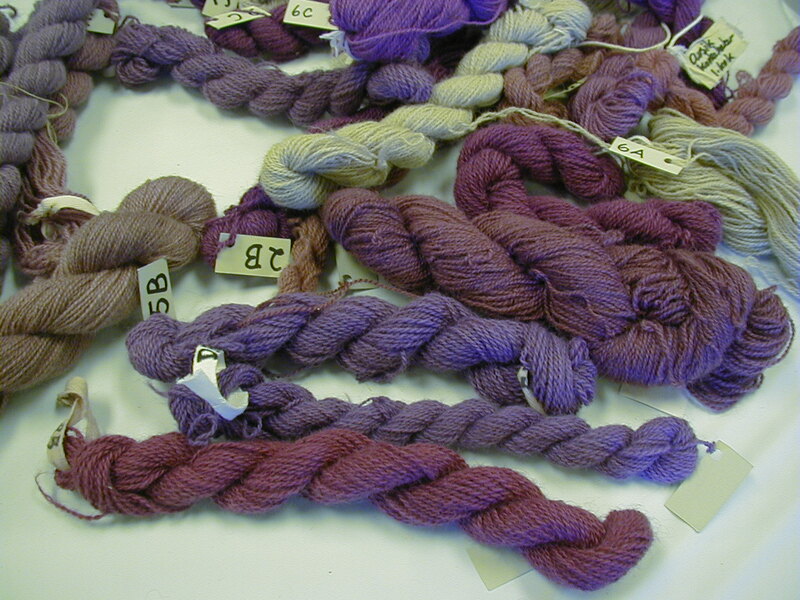 purples by overdyeing woad with madder. natural colours being tasteful and muted. simmer.). All that sort of thing. black (though getting a good black is quite surprisingly difficult). there's some seriously strange documentable Viking clothing out there. HT>|> > >lichens would also be available. HT>stuff is said to be dyed with "crottle", a lichen. accounts for the distinctive smell of Harris Tweeds. color which can be strengthened by using copper as a mordant. for the TAMPA BAY,FL. metropolitan area. Its another insect in the same family. acid as the coloring agent. Cotte, J and C. Cotte. 1916 "examen d'un pa^te pre'historique"
_Comptes Rendus se l'Acade'mie des Sciences 162: 762-64. >acid as the coloring agent. I think I saw a paperback version for a somewhat less obscene amount of money. wonderful source for textile people. in origin from late Roman/Migration Period"
came to be applied to other red dye yielding insects. thimk I'm addicted to libraries and suffering withdrawl symptoms! Scandinavia and/or the British Isles. turns up on imported silks, but not on wools or linens. correct. In "Textiles Cordage and Raw Fibres from 16-22 Coppergate"
madder was the more common red to be used in the wool textiles"
don't have enough madder in the dyebath? |> don't have enough madder in the dyebath? My wife, Dame Enid, has done a lot of madder dyeing. We (which often means me) pound the dried root in a big mortar and pestle. The first bit off the root gives the brown - we separate it. The next third of the the pounding gives the best reds. The last thirdis discarded. It's plant cores and is muddy again. She made a lovely pink baby blanket by letting the madder bath ferment (no additions needed, it ferments by itself). That was over two pounds of wool in six or so dyebaths. Consistent madder dyeing is possible, but takes a lot of care. Jennifer, we have madder growing in the garden. We've never used fresh root - I presume it needs to be dried before use? Do you know? Before that, we got our best madder from a supplier in Godalming, England, whose name escapes me at present. I know that she grew her own root. i know, that is an excessive amount, but it gave great color. misremembering which plant the dyestuff was from. a few of you briefly. Next year we won't be camped with royalty, we promise! >hear if anyone has any pertinent info. 145x30mm, of dark brown loose tabby, 18/Z/0.1 x 23/I/0.4. pH, fresh roots, roots dried for different lengths of time, etc. beautiful color. i cold water soaked it, btw. we get anything worth posting about.! that's it for now. anyone else doing anything? >beautiful color. i cold water soaked it, btw. sandlewood) break in one of the boxes I was bringing home from pennsic. GM>pH, fresh roots, roots dried for different lengths of time, etc. GM>beautiful color. i cold water soaked it, btw. GM>we get anything worth posting about.! would sure cut down on the work! >didn't use madder at some other point though. Millia Davenport _The Book of Costume_ pg 414 "European Dystuffs"
hunting coats until XIXc. The kermes of the cardinal's red gowns..."
I dont know her sources for this though. cochineal, and I assume kermes, tend towards purple. of which we have been deprived by standardization and fast colors." the excess iron. i saw it recently, and it was still a nice brown. > you might try boiling the galls in an iron kettle. prescribes gall nuts (correct word?) and green vitrol (iron sulphate). be used up in the end. parchment take this better, and the acidity helps the ink to stick. : and dyeing my own wool using period techniques this summer. historical info in it and pretty pictures. 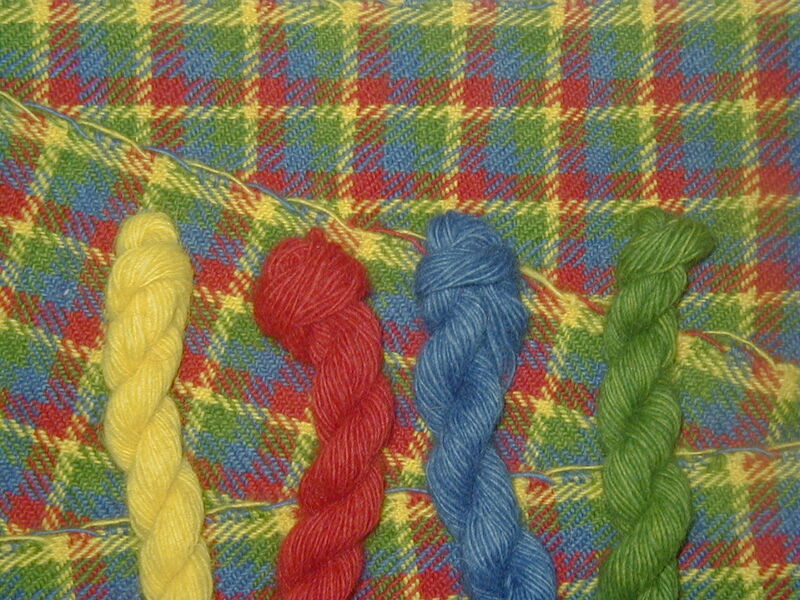 as for different blues... well, you can start with different color fibers. yellows give different blues to greens. haven't tried diff. mordants yet. also makes a difference. [stale urine is gentler on protein fibers, btw. with sulfuric acid. oop, and i'd rather not risk ruining my fine wools. you dip. and remember the final vinegar rinse. "what? why are my hand blue? aren't yours?" was prepared from this material. hartshorn)? This might make the job less troublesome than using urine. but we didn't try that). definite brownish tinge when held next to ythe dyed silk. since a bottle of Iron sulphate crytals doesn't look very period. the leather to produce the same black compound. Gokstad ship had painted details on it. the fun of watching the letters change colour as we wrote. >: get dye from woad? >all goes into producing flowers/seeds. >art and craft of natural dyeing". any woad seeds/plants, check with your local agricultural authorities. intentionally, having been declared a "pernicious weed". >were all muted! and not bright like modern materials. this is erroneous! >bedstraw, lichen, and woad would shine like a beacon. >surely will have samples to show you. used have since faded and look quite ugly. where I hope to work this summer...). >used have since faded and look quite ugly. >where I hope to work this summer...). serious damage that's been repaired about the bottom edges. and the pool tables were subject to essentially the same lighting. assumed that it *was* the same tartan, etc., etc. etc. |> : mordant to fix the dye, or simply re-dye as the colour fades? it will affect the wash-fastness. Some natural dyes do not require a mordant. (orchil, etc. ), indigo/woad, and walnut hulls (on wool anyway). Onion skins would be a mordant dye. Organization: Victoria University of Wellington, New Zealand. : mordant to fix the dye, or simply re-dye as the colour fades? with an alum mordant (standing in for clubmoss). you intend to be able to re-dye the garment, BTW. wealth. It will fade over time. the formula, and so can't be acids in the conventional sense. between metallic ions and non-metallic ions. (op. cit., p. 153). away from face, wash hands frequently, etc., etc. > Europe during the middle ages for dyeing. Alas, sad but true. > How did the medieval dyer achieve black? ++++++++ <--- Emphasis added. A.de B. > With much difficulty, rarely, and only for a few weeks at best. > black sheep...which again was rarely true black but rather dark brown. either "rusty" (brown) or "chalky" (blue). *Now you know why only Alizaunde de Bregeuf sells the cloaks Honour makes. >> With much difficulty, rarely, and only for a few weeks at best. >> black sheep...which again was rarely true black but rather dark brown. >either "rusty" (brown) or "chalky" (blue). which were never before published_, by Dr. M. Parker (Washington, Penn. : J.
Grayson, 1824). (Thank you, Mar Joshua, for sharing this source!) Dr.
of December A.S. XXVI (1991), "Instructions in the Art of Dyeing Black," pp. however; it's her best color. and iron, and of some early Byzantine samites that included black silk. Additionally, many early Coptic tapestry weaves are catalogued as "purple,"
overdyed purple and then saddened with iron. > How do you do it? > cloth and throw it into a big pot with some rich green leafy spinach. water of them in the sunne, and they will become greene. dye them what colour you like. myself. I've attempted but a fraction of the recipes in these books. >query: How do you do it? >cloth and throw it into a big pot with some rich green leafy spinach. "grayish gold". For green, you could use carrot tops "greenish yellow". dyed it with saffron first (for yellow) and then woad (for blue). I've read that different mordants will affect how yellow the saffron gets. coffee "brown" (darned strong coffee--my coffee stains are only beige). >>query: How do you do it? >>cloth and throw it into a big pot with some rich green leafy spinach. >"grayish gold". For green, you could use carrot tops "greenish yellow". >dyed it with saffron first (for yellow) and then woad (for blue). >I've read that different mordants will affect how yellow the saffron gets. MP: the blue must ever be proportioned to the shade of green required. MP: dyed in half an hour. MP: giving it a green by sulphate of indigo. MP: of acids and solutions of tin and alum. MP: shade; and copperas changes it to a brown. MP: been first soaked in hot water. curious and/or experienced clothdyers out there. with any notes, and I will send a sample of mine. piping. Or whatever else copper you can find. roaster that has no rust spots, or in a large plastic bucket with a lid. Warning: you cannot later use this container for any food related use. toxic.Garages, porches or the plain outside is best; summertime is ideal. fibre and swish it around periodically over a period of days. but apparently no-one's immune to the "secret family recipe" syndrome. I'll update if I find out anything new! green as copper carbonate (the form in malachite) forms. copper kettle as used for other dyes. Have fun and keep us up to date! >be feasible... or am I just indulging in wishful thinking? Remember that it prefers ACID dyes like wool (*not* like cotton). really contradict the "only muted tones are period"
>amount of salt in the water helps. Anyone know if this is true ? Salt will definitely help set colors, even in "store-bought" clothes. >>amount of salt in the water helps. Anyone know if this is true ? >Salt will definitely help set colors, even in "store-bought" clothes. > >amount of salt in the water helps. Anyone know if this is true ? > Salt will definitely help set colors, even in "store-bought" clothes. White vinegar is used with hand spun silk with good results. and on the bargain table cotton cloth. > through too many washes)? > be feasible... or am I just indulging in wishful thinking? wash the fabric thoroughly before dyeing. thing to use on anything light colored that something else has "run"
searching out a better source. fresh dyebaths, rinsing in between until the color stops running. >roughen the wool) were what caused peasants to wear dull autumn colors. >be a TI article in there somewhere. times as dyepots would be a good first step. bronze for larger ones. (there is also other time-period shifts of usage). in to collect its urine (circa 1120 A.D.). Remember that using your cooking pot for dyeing may result in dying! is *not* my primary area of interest! Here is a little period dye info I just found on the web. garment. It cost its weight in gold. directory of weavers and spinners was published as well. Cloths by Means of Moulds"
bags of Cochineal (insect dye) each. 1429 the 1st European book on dyeing "Mariegola Dell'Arte de Tentori"
Mexico and Peru now being shipped back to Spain. the late 12th C on. anything I've read so far. Crowfoot, Frances Pritchard and Kay Staniland, Museum of London, 1992. > I need a source for materials. in the lunch room and it has disappeared. > in the lunch room and it has disappeared. Senatorial rank by statute-- only a few others could afford it! another excuse to wander through one of my favorite bookstores! > with brownish highlights, and I am wanting to dye it black. to fibers and also tend to fade. > what type of dye should I use? > dye in some fabrics. Is this true for wool? after, or all your hard work will be eaten away. > >> Cold or hot process? > always machine wash it warm & gentle forever after. linen or any of the man-made fibers other than rayon. I, too, would like to know sources for kamala and fustic. can help, but she's never found it necessary. > how do you use either the bug or the cactus to dye with? to make teas in, or I have made a small cotton bag and put themin it. woolin and which mordants you have pre-mordanted your wool in. Cochineal is easily found in Texas and Oklahoma on Prickly Pear (Opuntia). same lovely colors, the kermes not being as strong as the cochineal. >how do you use either the bug or the cactus to dye with? chessecloth bags so that bug parts are not in my dyestuff). Dye as usual. removed and dye is ready to use. >water, and what temperature of water? it is added but not boiling. dye bath to be on the safe side. Subject: Re: ANST - natural dyeing ..
> How can I get in touch with Dharma Dyeing Company? Another excellant book on fibers is Rita Buchanan's "A Weaver's Garden"
are also from Interweave Press. >I have dyed several yards of silk gauze purple with Rit dye. >But still it bleeds! What else can I do to fix the color? acid dye they use in Rit isn't exactly the most washfast anyway. fabric in an acetic acid solution after you removed it from the dyebath? whatever color I got. If not, then I would redye the fabric. I hope this is helpful. Modern chemical dyes, I know about! rolled their eyes when I told them I was dyeing with RIT. second component of the dye. waiting to smear and run when I weave with it. >I was wondering if there are any period ways to die fabric without heat. >me ever and cash resources are low. colorfastness would probably be rather poor. is not period, but it is safe, since no toxic chemicals are involved. would recommend using a canning pot. a little hard to keep stirring the fabric do to the height of the pot. Now, a few words of caution. Never use utensils that you cook with for dying. If your using a powdered dye do not mix it in the kitchen. Take it outside it's to easy for it to get air born and all over the kitchen. Very helpful folks especially if you don't have much experience. >thepot for canning after I've dyed things in it. you folks, contact me direct if you want to buy any of them. postage. They are A5 slim volumes.at 2.50 pounds each. answered earlier to the request for proper onion skin-dye instructions. always happen and when it does, the spots can hardly be seen. completely cool. It will exhaust the dye that way. Subject: Re: [Sca-cooks] OT Authenticity Police: dye colours. ceramic pot and then double dye to get the green....add woad for blue. orange is also a double dye weld then madder. I play a lot earlierr than the SCA. some shows. And don't forget polished linen can look shiney. colors were more expensive and more desirable. rather quickly replaced the more expensive kermes in the 16th century. understand it, was what is now Turkey. even know if kermes is even available. such as dyer's broom, which was also used in Europe. before it is dyed, or the dye will wash out or light fade. in home dyeing because it is so toxic, wasn't used until much later. Both tin and chrome produce very bright colors. woad contain similar chemicals and produce similar blues. There was a photo essay in Saveur also some years back. > > Thank you for the most interesting tidbit on this. costume seminar at Williamsburg - fantastic colors! advance of the coal-tar colour industry. kings and general were dyed, also contains a derivative of indigo, vis. must have been very small on account of the high prices realized. countries, the princes and Governments prohibited the employment of indigo. and state should refrain from using it." Xeroxing all that appeal to me. > imported along with the other Asian spices such as pepper. Southwest Asia - and in North Africa, and thence to Spain. possibilities, all toxic), white, and black. >>> dying linen with saffron? >>> actually dying silks and linens using saffron. do the trick and the color turns out incredibly rich. Not just period dyes, although many are. and would be happy to send the info this evening if you want them. I find it gives you more control over the final product. (although slightly less plant-your-own oriented).